The day I got the iMonster line in the mail, Ian picked up the snack keeper and said he had seen it online and thought it was cool. I didn't even know Ian looked at baby stuff online! So this line is definitely dad approved. When it comes to things like plates, bowls and flatware, I am generally the mom that reaches for the cheapest thing at the store. I can't justify spending three times the price on a name brand product that looks the same as a generic product. Enter the iMonster set. A fun product that is reasonably priced! And, the kicker? It's a line meant for moms of boys!!! Finally! As a mom of a boy, you quickly discover that practically everything out there is geared toward girls. And this stuff is sturdy. 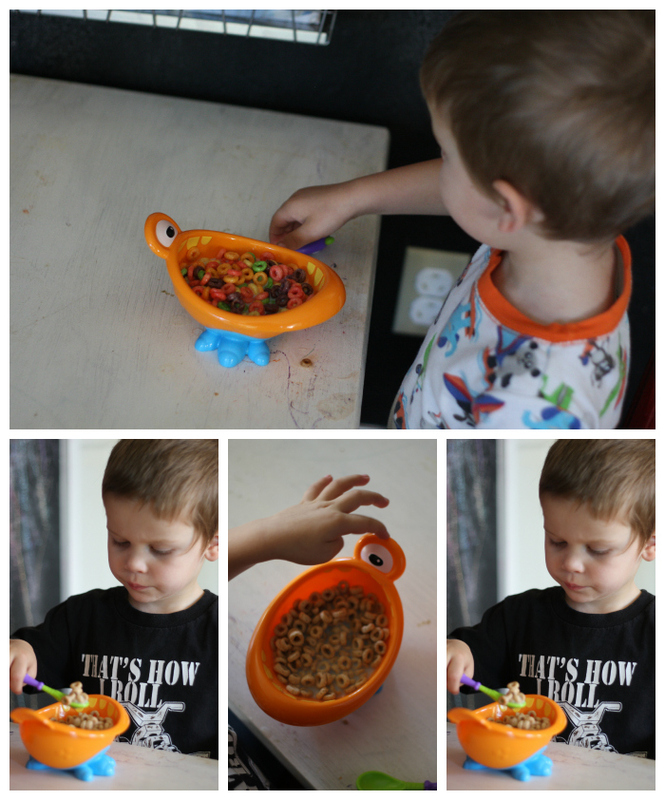 It is made of heavy duty, BPA free plastic that is both microwave and dishwasher safe. What I loved is that I could use the products as a little teacher as well. I have Connor count the eyes on the various products. I also make him tell me the colors of the various monsters. That makes it fun for me...and hopefully him. And I like that both the bowl and snack catcher have "feet" on them, which makes them very sturdy. As for the snack keeper, have you really ever seen anything cooler?! My kids are fighting over it. Or more, Connor gets angry when he turns his back and Isla grabs it. It is just as much a toy as it is useful. And, I must say, it is the best snack keeper I have used. Why? Because the top cannot easily be removed (it's a screw top)! By the time Connor was about a year old, he would just pull the top off of snack keepers and food would be e-v-e-r-y-w-h-e-r-e, thus rendering them useless. But not the iMonster. In fact, "he" makes eating fun. The first thing Connor did was stick his hand in the monster's mouth and say "he eating my hand." Love this snack keeper! It's just a cool, useful and smart product. The snack keeper even made the cut to go on vacation with us. We like it THAT MUCH. 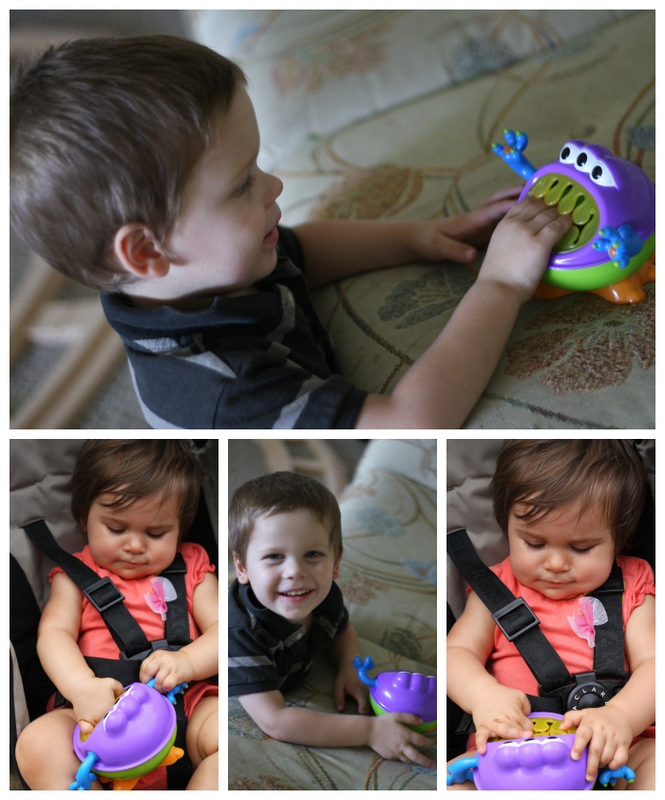 You can purchase the iMonster feeding set and snack keeper at www.BuyBabyDirect.com. And through 8/31, you can get 25% off your entire order at www.BuyBabyDirect.com with the code: baby25. 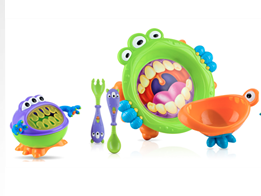 And just so you know, Real Mom Reviews is hosting a giveaway for an iMonster feeding & drinking set. Hurry on over and enter. Her giveaway ends on the 30th.